One final drawing of the night. 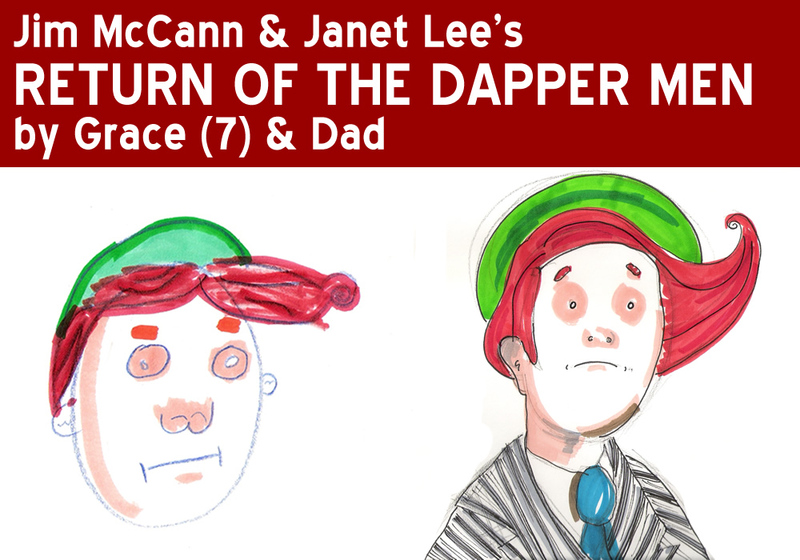 We’re only a few short months away from the release of “Return of the Dapper Men” by Jim McCann and Janet Lee through Archaia Comics, two good friends of 5 Minute Marvels. Click here to pre-order the series. I have to say, I am proud of this one from Grace. Janet Lee’s style requires very subtle shading (and a GIGANTIC bag of Prismacolor markers) … and Grace imitated it very well! 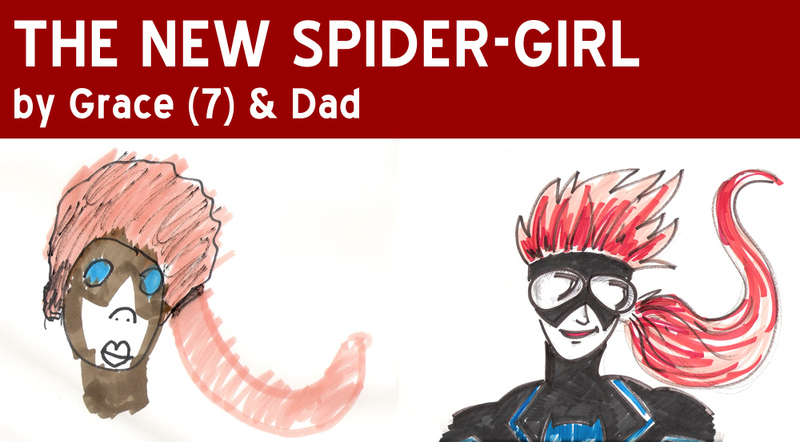 At San Diego Comic Con, the House of Ideas revealed a glimpse of the new Spider-Girl by Paul Tobin and Clayton Henry. Grace and I dig the spikey hairdo (kinda reminds us of Cate) and the wild ponytail. So, we drew her. Enjoy! I love this drawing of the Hulk from a father and son team! Grace and I had a lot of fun with the “Draw Gronk!” contest…and we wanted to have another draw-a-long. 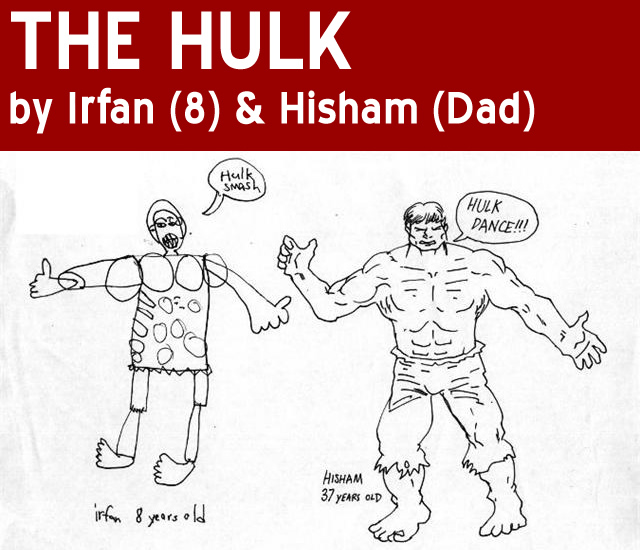 So, we’re building a super team … adn we want you to help us populate it with your own creations. 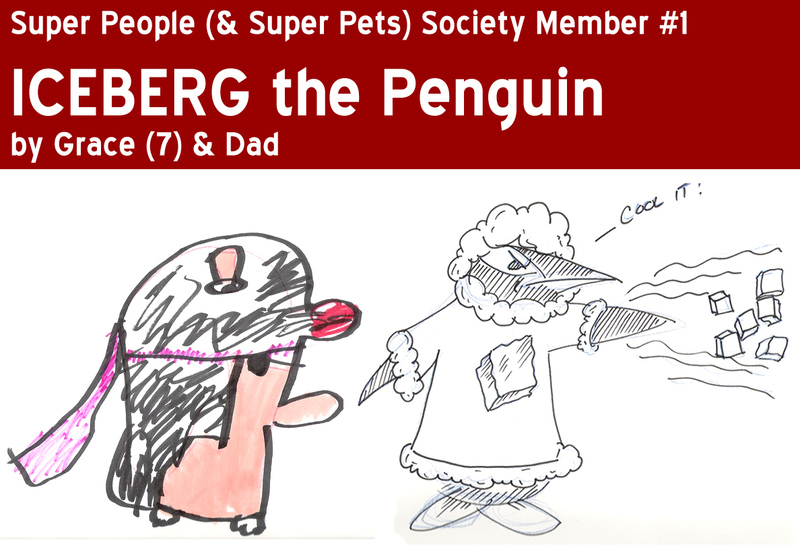 Give us fun super heroes to make this the bestest group of metahumans in the universe — The Super People (& Super Pets) Society! 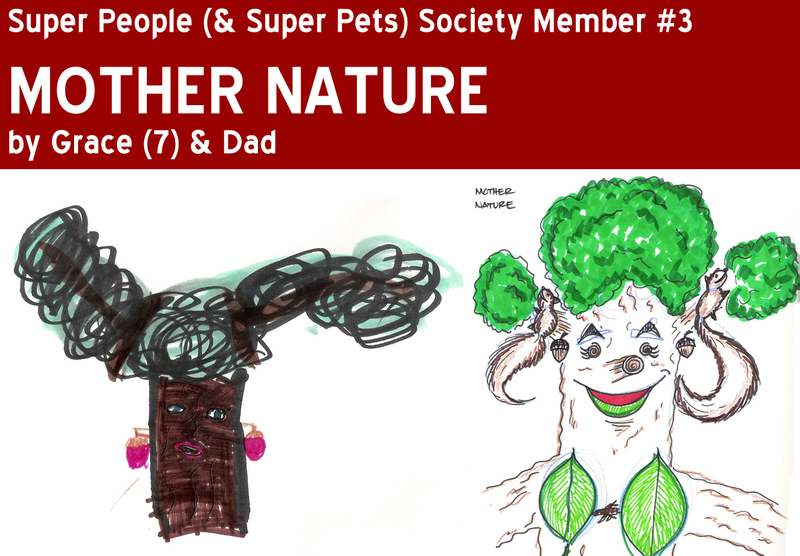 This contest is really for kids and their parents, but, adults without kids, if you want to send in art, you are welcome. But, remember, this is for kids. 🙂 So, tone down the sexuality and the darkness. They have a long time to get into that sort of stuff. We’ll pick the leader of the team from the entries and see if we can’t get folks to draw it with us! 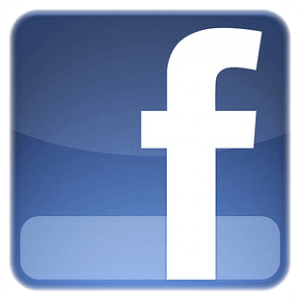 – Powers: He can shoot ice at the bad guys. – Origin: He was granted his amazing powers by “Mopey,” the snow elf. – Powers: Super strength. Super cheesy. Super stinky. – Origin: While on a tour of a cheese factory, chemist Gary Gouda fell into a vat of spoiled milk. 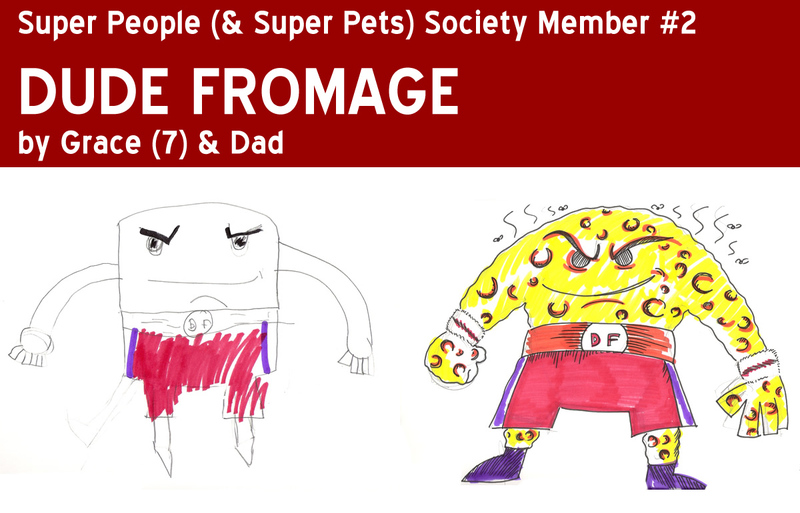 The chemicals in his pockets mixed with the milk and transformed him into a mighty mountain of cheese. – Powers: Can animate flowers and trees and uses her branches to attack humans who cut down or abuse trees and plantlife. – Origin: A careless forest fairy didn’t realize that as she swung her wand while walking amongst the trees and hit one with an errant bolt of magic, transforming her into the wooded avenger, Mother Nature. 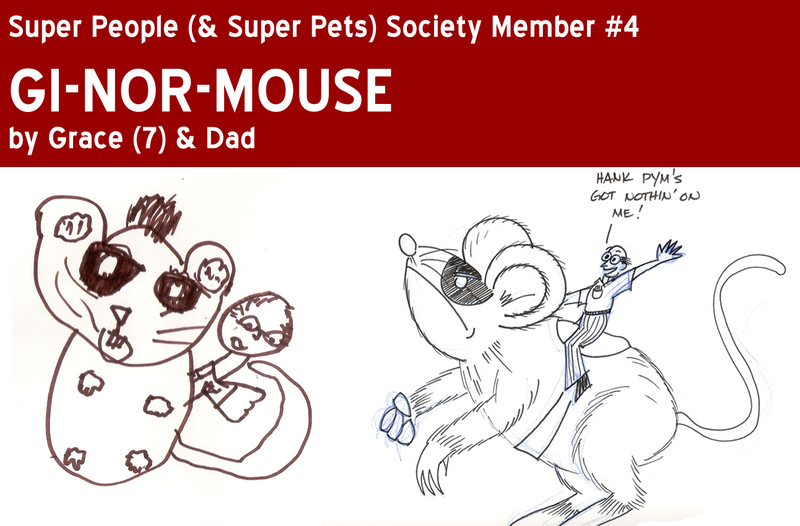 – Powers: Um … he’s like a really,really huge rodent. With a mask. And a scientist riding him. Duh. – Origin: After years of research, scientist Dr. Farcus J. Boxleitner created a formula that would revolutionized farming creating enormous fruits and vegetables — a feat which could solve world hunger. Instead, he used it to transform his lab mouse into a gargantuan. And, then he accidentally lost the formula. So, now he fights crime. Well, the mouse fights crime. Farcus just rides him. That’s why Gi-Nor-Mouse wears a mask. He embarrassed about the whole Farcus riding him thing. The only thing Grace loves more than superheroes? TEEN-AGED superheroes. So, she jumped at the chance to draw the entire crew of Avengers Academy by Christos Gage (www.ChristosGage.com) and Mike McKone (www.twitter.com/Mike2112McKone) — Finesse, Mettle, Striker, Veil and Hazmat! What about Reptil, you say? Well, Grace chose to omit him. But, she promises that, “I’d draw him with a dinosaur head …” Stay tuned. 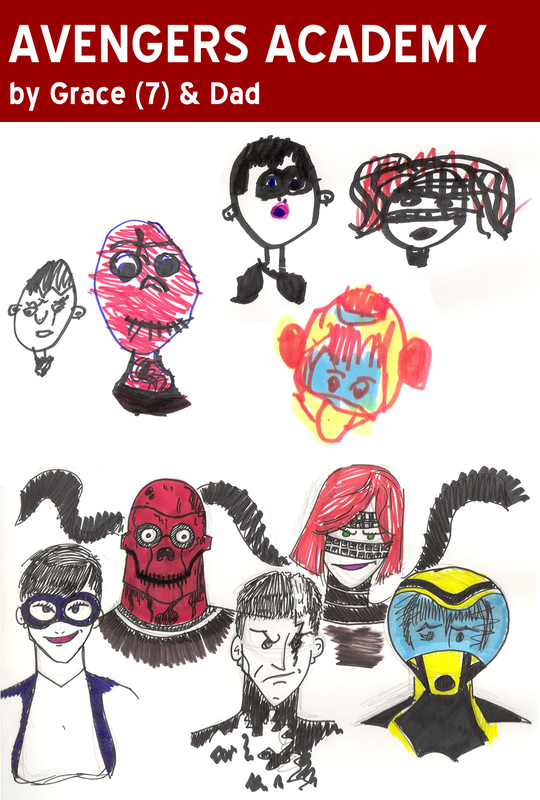 The strike isn’t really over … she’s still not interested in drawing super heroes … but she is drawing. 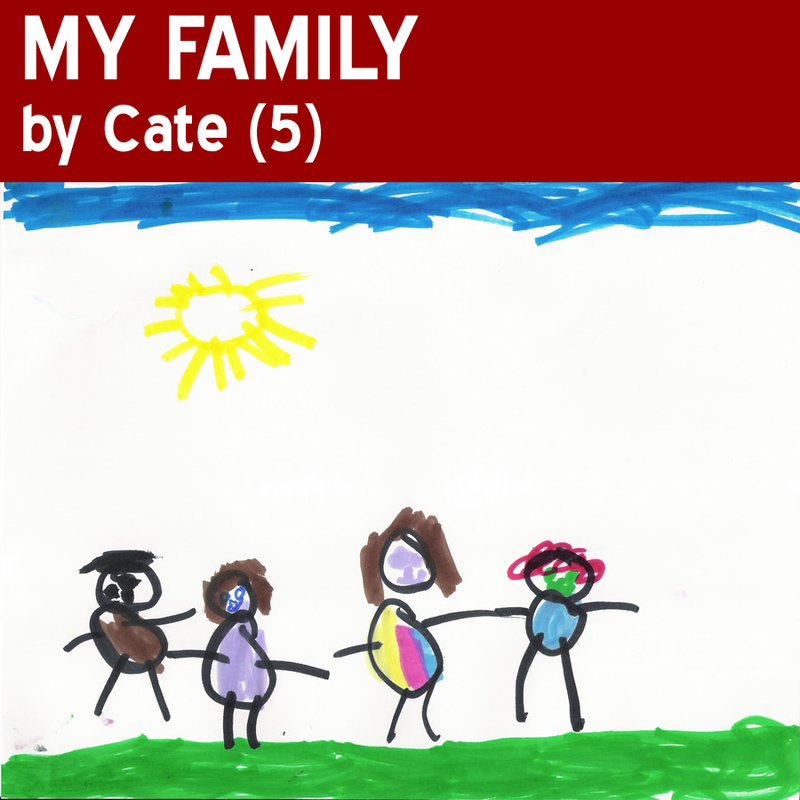 Here’s a quick portrait she created of the family. 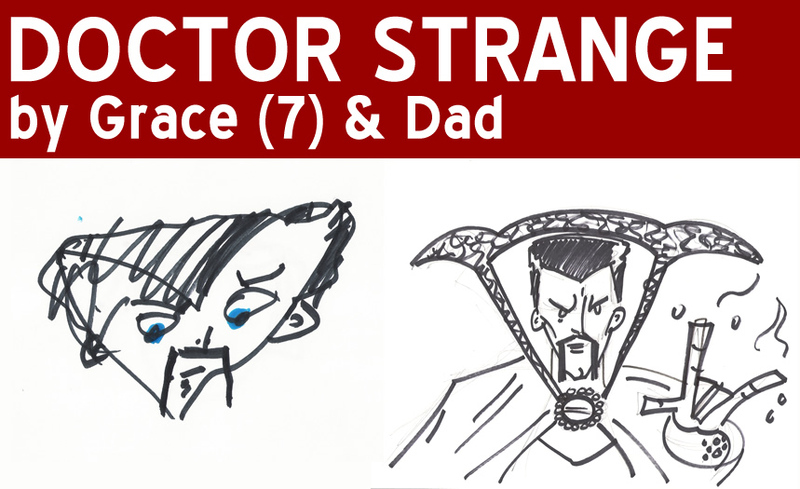 And, speaking of leaving things behind, Grace, Cate and I were treated to this sketch of Doctor Strange by our friend and previous collaborator, Jen Richards (www.twitter.com/mockingnerd) some time ago. I am sorry it took so long to get it up, but I think it inspired Grace to do some really solid work on Dr. S’s face. To enjoy more of Jen’s awesomeness, head on over to http://themockingnerd.blogspot.com/ and fall in love.